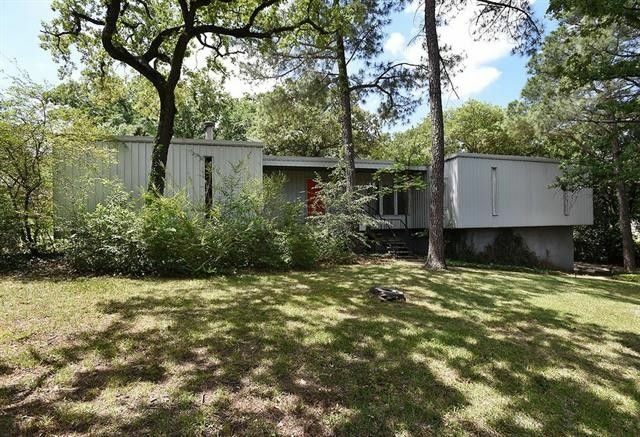 Remarkable one story Mid-Century Modern home with 27X20 greatroom with metal fireplace, plenty of room for a grand piano-- that opens to the dining room with windows overlooking the oak-shaded half acre yard. Four bedrooms with 2 & a half bathrooms is generously accommodating to the new owners. The kitchen & master suite each have doors to the 12X9 ft. balcony with wooded views of the private back yard. The Mid-Century Modern kitchen is sure to please with its characteristic yet ample cabinets & breakfast bar, range & microwave. The side entry double garage is at basement level along with a game room and craft room. Mid-Century Modern enthusiasts won't want to miss this lovely airy home! Directions: Take I-35 E to Lillian Miller Parkway; turn right onto Southridge Dr., and right onto Pennsylvania Dr., Take a right onto the 1300 block of Ridgecrest Circle. The home is on the right.